BNSF's service delays last year led to the unit getting called out by Warren Buffett for disappointing customers in Berkshire's annual report filed March 1. TOKYO (Bloomberg) -- Railroad companies are struggling to keep up with surging U.S. demand for trucks and SUVs, frustrating Ford Motor Co. and Toyota Motor Corp. The shortage of rail cars is particularly acute for double-deckers big enough to fit taller trucks and SUVs stacked on top of one another. 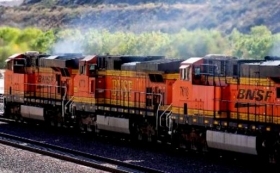 BNSF Railway Co., owned by Warren Buffett’s Berkshire Hathaway Inc., will buy almost 1,900 this year, more than its combined total purchase of both bi-level and tri-level rail cars during the last two years. Toyota, whose production system is renowned for avoiding overproduction and inventory build-up, is paving over space at two U.S. plants to park models including the Highlander SUV during times when there aren’t enough rail cars available. Carmakers are finding it harder to get vehicles to dealerships as demand for trucks and SUVs extends the U.S. auto market’s longest expansion since World War II. Americans bought 7.2 million trucks and SUVs last year, up 11 percent from a year earlier and the most in a decade, according to researcher Autodata Corp. Demand rose to a record for Ford’s Escape utility vehicle and reached an all-time high for Toyota’s entire SUV line and Honda Motor Co.’s set of light truck models. The rail industry’s struggle to keep up with the car industry’s growth was felt last year, when unusually harsh winter weather forced companies to slow down locomotives and run shorter trains. That led to backlogs for commodities that make up a bigger share of cargo, including fuel, coal and grain. The disruptions left automakers with as much as about 250,000 vehicles waiting to be shipped by rail, according to TTX Co., the rail-car pooling operator. The typical industry standard is having about 70,000 shippable vehicles on the ground and waiting to move. With many of Toyota’s plants running six days a week, there’s no time to make up lost production, Mason said. Last year, with its own factory yards packed full of vehicles waiting to be picked up, the company had to lease off-site space or park cars on employee lots and test tracks. Now, Toyota is paving more land it owns surrounding assembly plants in Indiana and Kentucky so that it has storage capacity for at least five days’ worth of production, instead of three days or less, Mason said. Ford has also resorted to parking some F-150s at its test track in Dearborn, Mich., which can accommodate about 8,000 to 10,000 vehicles, Mikkelsen said. Honda has added parking space at its facilities and expanded the use of trucking to move vehicles by 10 to 15 percent, said Dennis Manns, the carmaker’s vice president of sales and logistics planning. BNSF’s service delays last year led to the unit getting called out by Buffett for disappointing customers in Berkshire’s annual report filed March 1. The company will spend $6 billion on infrastructure and equipment this year, almost 50 percent more than any other railroad has spent in a single year, according to Berkshire. “Our huge investments will soon lead to a system with greater capacity and much better service,” Buffett wrote in his annual letter. Rail companies will add about 1,070 bi-level rail cars and more than 550 tri-level rail cars to the North American pool by the end of this month, after adding few units in 2012 and 2013, Toyota’s Mason said. The companies have committed to adding another 4,000 additional multilevel rail cars in 2015 and 2,700 in 2016. CSX Corp. plans to expand its fleet of auto rail cars by about 6 percent this year, Melanie Cost, a spokeswoman, wrote in an e-mail. The company will add rail cars with racks that are convertible, making it possible for them to be used either as bi-levels or tri-levels. Norfolk Southern Corp. doesn’t disclose its plans for automotive carrier acquisitions for competitive reasons, said Robin Chapman, a company spokesman. “They’re not back to where they need to be yet, but they are responding,” Ford’s Mikkelsen said.